Since then, I had been thinking about trying a mushroom kit, sure they are more expensive, but probably more likely to succeed as they are designed to help you grow mushrooms at home. I hadn’t decided which one to try, so I was very pleased when my friends at Biome Eco Stores sent me a Life Cykel Mushroom Kit (Affiliate link) to test. These are nice and small (unlike my big boxes of mushroom compost), so they can be kept in your kitchen. The kits consists of a cardboard box containing a plastic bag filled with coffee grounds collected from cafes (recycling!) which is inoculated with oyster mushroom spores and ready to grow, you just have to cut open the bag. I got my box a few weeks ago and followed the instructions carefully (it was a struggle, I don’t like following instructions). I just had to cut open the box and the bag, and spray the coffee grounds with water twice a day. I kept the box in the kitchen where I would remember to do this. After waiting longer than the specified 10-16 days, I did start to worry that I had done something wrong, but then I checked out the Life Cykel website and watched the video in the “How to Grow” section (I recommend you do this before starting) and I was reassured that my box was just taking a bit longer to grow. It must have known, because the very next day I started to see tiny mushrooms poking out, wow they must grow fast when they get going! Life Cykel recommend that you wait until the mushrooms are big and nearly unfurled before harvesting all of them, and then continuing the process to produce another crop. You can even turn the bag around for a third crop. My first crop of mushrooms didn't get very big before they started to dry out, so I just harvested them early and cooked them in butter (they were yummy!). 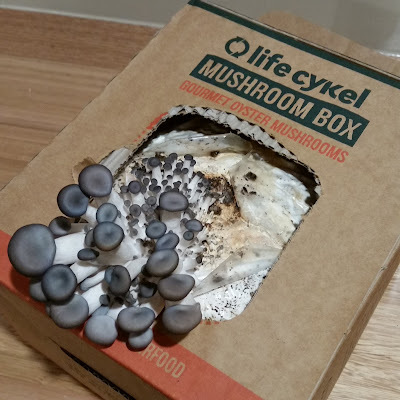 For the second crop I put a plastic bag over the box and they got bigger, but I left them too long (they spread spores around the box), they still tasted great though. I am currently waiting for the third crop since I turned the bag around. The box is supposed to produce about 300-500g of mushrooms over the three crops. Of course I’d like to produce the mushrooms myself without buying a kit each time, but fungi are a bit more tricky than growing veges! 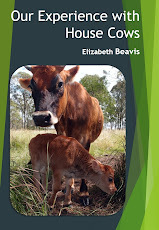 I think starting with a kit is a good way to get more confidence before taking a step into your own mushroom production (if that’s where you want to go, there is heaps of great information from Milkwood). I’m thinking that my original mushroom farm compost idea might have worked better if I had put it in a smaller box. I bought two because they were so cheap, but it was more than I could look after. I really do need to do more reading on this subject, but in the meantime I definitely recommend the Life Cykel Mushroom Kit (Affiliate link) from Biome Ecostores as a very easy way to get started with mushroom growing. 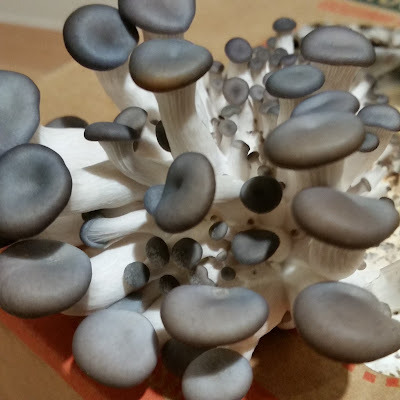 Its been a fun learning opportunity, a step towards eventually growing my own mushrooms, and an interesting project (it would make a good gift for a foodie – a source of the freshest possible oyster mushrooms!). Have you tried growing mushrooms? From a kit or another method? And are you brave enough to wild harvest fungi? 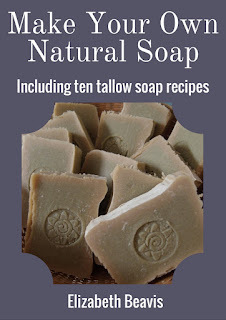 Thank you once again for using my affiliate links to purchase from Biome Eco Stores, this helps to support my blog and let me continue to bring you useful information. The mushroom box was sent to me as a free trial, and I have accurately reported the results and my opinion of the product. We did buy a kit from IGA years ago when they had them but no mushrooms grew so we gave up. Glad you are having some success though, Liz.